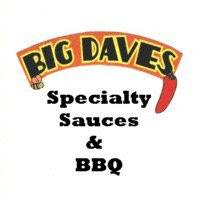 Hot pepper sauce can be found on nearly every table in just about every Texas BBQ joint. Meyer's Elgin Smokehouse is no exception. While some joints rely on familiar national brands, Meyer's serves their own take on the traditional vinegar and pepper blend. Their sauce, however, isn't just a spicy condiment to drop on your favorite sides, it also doubles as a wing sauce. Meyer's Texas Hot Pepper and Wing Sauce is a thin red pepper sauce with a bold, spicy flavor. It's a simple blend consisting of just vinegar, peppers and a couple incidentals. Despite the standard recipe, the flavor manages to stand out from the national brand pepper sauces that I typically use. I've used the sauce on multiple occasions with positive results each time. I first used the sauce for grilled chicken wings. It was too thin to brush on the chicken, so I essentially dipped the wings once they finished grilling. The tangy, spicy sauce was excellent on the grilled chicken, but would have been even better had it clung to the bird better. Perhaps it would be better suited for fried (breaded) chicken which would hold more of the sauce. 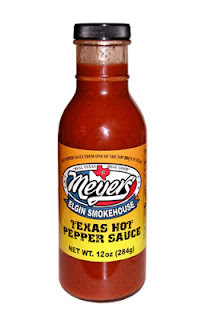 Like Frank's or Texas Pete, Meyer's pepper sauce is an all purpose flavor enhancer. It adds a new dimension to everything from eggs to potatoes and tacos. I primarily used the sauce on Mexican dishes like tacos and nachos. Meyer's Elgin Smokehouse is known for BBQ, but their Texas Hot Pepper Sauce deserves some notoriety as well. It's every bit the equal of any national brand sauce. Versatile enough to cover wings or drip over nachos. For any occasion, it's a solid choice. 1 Response to "Meyer's Elgin Smokehouse Texas Hot Pepper Sauce"